KCRW goes social on iTunes 10 PING! 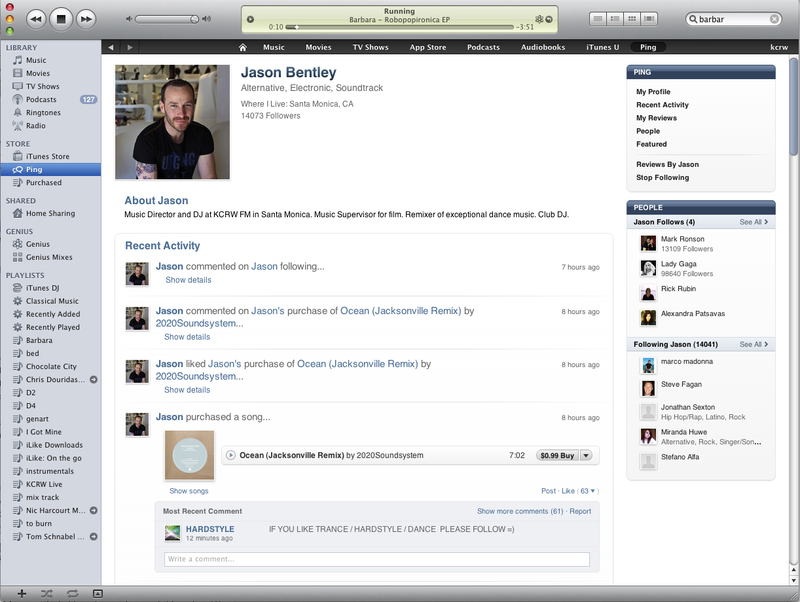 When we started buzzing about iTunes 10 here in the KCRW web room, it was no shock (but GREAT news) to have Jason Bentley tell us that he was selected as one of just a handful of musicians and taste-makers to be a FEATURED iTunes PING Profile! (along with names like Rick Rubin, Alexandra Patsavas, Diddy, Lady Gaga, Dave Matthews Band, more). The new version of iTunes launched just last night so we are updating, building profiles and getting to know the new service. Meanwhile, Jason has almost 15,000 followers and has made tons of great music suggestions, ranging from tunes that he’s played in DJ sets around town, to album suggestions by artists performing live on KCRW’s flagship show, Morning Becomes Eclectic. I suggest you get in there and follow him for yourself to see what he is up to! I’m building my own personal profile now, and reading blog posts about its reception. I will be working alongside KCRW DJs and our esteemed Music Librarian, Eric J. Lawrence to build out the KCRW presence on iTunes PING. Find us there, listed as KCRW Radio. If you haven’t already done so, download iTunes 10 here, and tell us what you think about iTunes PING!